Growing up in southwestern Iowa, Denny McCoy has always been a cowboy. He’s a second generation rough stock rider, having learned the ropes from his father, Joe, and when offered a rodeo scholarship at Oklahoma State University in Stillwater, he jumped at the chance. It was there, while at a study group with friends, he met Janet Tucker, from the southeast Oklahoma town of Finley. Janet herself was a rancher’s daughter, so the pair was well-matched. “My roommate was studying with these guys, because we lived in the dorms, and she wanted me to go with her one afternoon to study, and Denny is one of them she had gone to study with,” Janet recalled. After getting married in 1967, the McCoys moved from Stillwater to Iowa. They eventually relocated to Dumas, Texas, where Denny worked as a cattle buyer. “When we moved to Dumas, I was buying fat cattle for American Beef, and that’s when they were first building the feedlots in the Panhandle. We lived in Dumas for three years,” he said. Once the two were married, Janet began rodeoing alongside Denny, competing in barrel racing. She won quite a bit, including an American Paint Horse Amateur World Championship. Eventually, they moved to Madill, Okla., where they lived for several years, before finally moving to a home east of Tupelo, where they still live. “We bought a place in Madill and lived there about 13 years, and when we sold it we bought this house, and have been here ever since. I think we moved here in 1991,” he said of the home that sits off old highway 3 west of Tupelo. For Denny, there was never any question about living in Oklahoma. “I’ve always loved Oklahoma,” he said. Denny and Janet raised five children: Justen, Nikki, JoRay, Jet, and Cord. “All the kids rodeoed, and it has never stopped. When Janet and I first got married I rodeoed, and when I kind of quit I had kids old enough to rodeo. When they all went off on their own I started hauling bulls, so I’ve been going my whole life,” he said. All four boys were accomplished cowboys who competed in rough stock events, while Nikki was a barrel racer. Still, it was the youngest boys, Cord and Jet, who are the most well-known. Both boys were five time International Professional Rodeo Association World Champions, while Cord also made the Wrangler National Finals Rodeo and the Professional Bull Riders Finals several times. “They have all been very successful at rodeo. Jet and Cord probably took it to the next level because they kept doing it, but all the kids were very successful,” Denny reminisced. JoRay also made the International Finals Rodeo in 1994, while Nikki won several world and national titles in the APHA. It was during one of Cord and Jet’s banner years in the IPRA that publishing giant Sports Illustrated came for a visit. The writer, Jeff Pearlman, stayed for a two-week stint in late 1998. “You could tell he was out of his element. He was from New York, so he rented a car to come down here. He thought we were having a plague because of seeing dead animals on the side of the road,” Janet recalled with a smile. Soon, more than rodeo fans got to know the two younger brothers. They competed on the CBS television reality competition the Amazing Race Season 16 in 2009. They returned for Season 18: Unfinished Business, and Season 24: All Stars. Although the pair was competitive each year, and finished second once, they never claimed the million dollar prize. When asked what advice to give parents whose children want to rodeo, his response was simple. “Just take them,” he said. 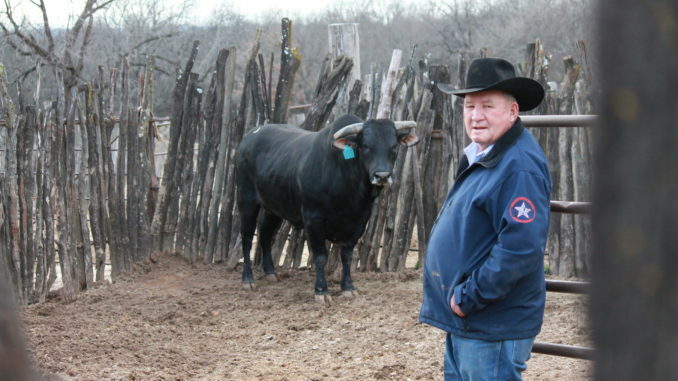 Read more about Denny and his bucking bull business in the February issue of Oklahoma Farm & Ranch.